It’s entirely possible to do your coding in vim or emacs, hammering out hotkeys to drive the interface and bring your code to life. While working in such a way has its charms, it can be confronting to new coders, and that’s before even considering trying to understand command line compiler settings. The greenhorn coder may find themselves more at home in the warm embrace of an IDE, and [morrows_end] has now built one for those working with AVR assembly code. The IDE goes by the name of Simple AVR IDE, or savr_ide for short. Programmed in C++ with the FLTK widget library, [morrows_end] has tested it on Windows XP, but notes that it should successfully compile for Linux, Unix, and even MacOS too. All the basic features are there – there’s syntax highlighting, as well as integration with the AVRA assembler and AVRDUDE for programming chips. It’s a tool that could make taking the leap into assembly code just that little bit easier. For another taste of bare metal coding, check out [Ben Jojo]’s discussion of x86 bootloaders. The technology is loosely described in US Patent 5628686, which discusses the method used to communicate bidirectionally with the Sidewinder joystick. [MaZderMind] found that the patent documents didn’t correspond exactly with how the Sidewinder Precision Pro communicated, but it was close enough that the operation could be reverse engineered. The plan is to use the vintage joystick to control a quadcopter, so the interface was implemented on an AVR, and a graphical LCD installed to act as a display for testing the operation. [MaZderMind] also captured data on an oscilloscope to indicate in detail the quirks of the joystick’s operation. Yes, it’s entirely possible to use a more modern microcontroller with a USB joystick. However, there are few that measure up to the standards of the old Sidewinder hardware, and sometimes the best tool for the job is the one you’ve got with you. A traditional single joystick is a different take on quadcopter control, but there’s other options – gesture control is possible, too. Microcontrollers are small, no one is arguing that. On a silicon wafer the size of a grain of rice, you can connect a GPS tracker to the Internet. Put that in a package, and you can put the Internet of Things into something the size of a postage stamp. There’s one microcontroller that’s smaller than all the others. It’s the ATtiny10, and its brethren the ATtiny4, 5, and 9. It comes in an SOT-23-6 package, a size that’s more often seen in packages for single transistors. It’s not very capable, but it is very small. It’s also very weird, with a programming scheme that’s not found in other chips from the Atmel/Microchip motherbrain. Now, finally, we have a great tutorial on using the ATtiny10, and it comes from none other than [Ben Heck]. The key difference between the ATtiny10 and other AVRs is that the tiny10 doesn’t use the standard AVR ISP protocol for programming. Instead of six pins for power, ground, MISO, MOSI, SCK, and RST, this is a high-voltage programming scheme that needs 12 Volts. The normal AVR programmer can do it, but you need to build an adapter. That’s exactly what [Ben] did, using a single-sided perf board, a lot of solder, and some headers. It looks like a lot, but there’s really not much to this programmer board. There’s a transistor and an optocoupler. The only thing that could make this programmer better is an SOT-23 ZIF socket. This would allow bare tiny10s to be programmed without first soldering them to a breakout board, but ZIF sockets are expensive to begin with, and the prices on SOT-23 sockets are absurd. Programming the device was a matter of loading Atmel Studio and going through the usual AVR rigamarole, but Ben was eventually able to connect a light sensor to the tiny10 and have it output a value over serial. This was all done on a device with only 32 Bytes of RAM. That’s impressive, and one of the cool things about the smallest microcontroller you can buy. If we say that a hacker is somebody who looks at a “solved” problem and can still come up with multiple alternative solutions, then [Charles Ouweland] absolutely meets the grade. Not that we needed more evidence of his hacker cred given what we’ve seen from him before, but he recently wrote in to tell us about an interesting bit of problem solving which we think is a perfect example of the principle. He wanted to drive a salvaged seven segment LED display with an AVR microcontroller, but there was only one problem: the display needs 15V but the AVR is only capable of 5V. So what to do? As it turns out, the first step to solving the problem was verifying there was actually a problem to begin with. [Charles] did some experimentation and found that the display didn’t actually need 15V to operate, and in fact would light up well enough at just 6.5V. This lowered the bar quite a bit, but it was still too high to power directly from the chip. There were a few common ways to solve this problem, which no doubt the Hackaday reader is well aware of. But [Charles] wanted to take the path less traveled. More specifically, the path with the least amount of additional components he had to put on his PCB. 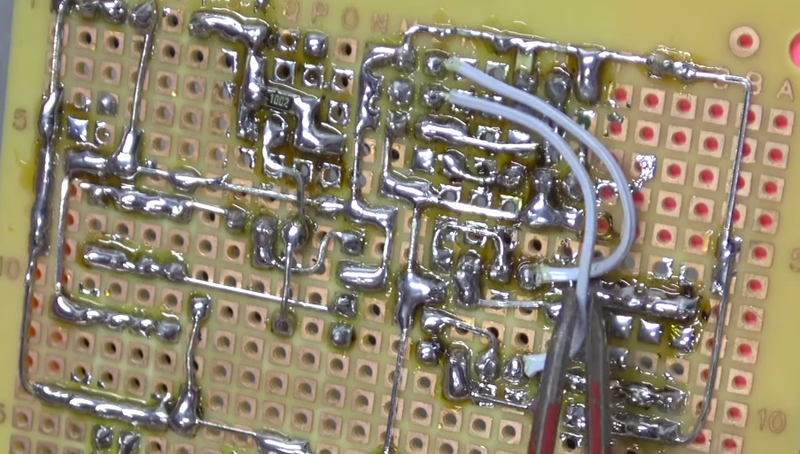 He set out to find the absolute easiest way to make his 5V AVR light up a 6.5V LED, and ended up coming with a very clever solution that some may not even know is possible. 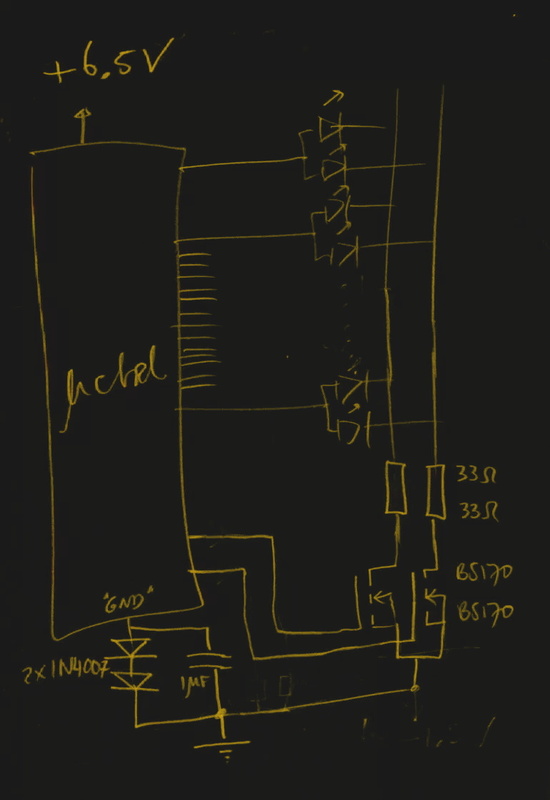 He reasoned that if he connected the source pins of two BS170 MOSFETs to a voltage of -1.5V, even when the AVR pin was 0V, they would be still be receiving 1.5V. This virtual “step ladder” meant that once the AVR’s pin goes high (5V), the relative voltage would actually be 6.5V and enough to drive his LEDs. Of course the only problem with that is that you need to have a source for -1.5V. Getting a negative voltage would normally require adding more components to the design (which he set out to avoid in the first place), but then he came up with another clever idea. To pull the trick off, he actually feeds the AVR 6.5V, but raises the ground voltage by 1.5V with the addition of two 1N4007 diodes. This way the AVR gets a voltage within its capabilities and still can provide a relative 6.5V to the LEDs. One might say [Charles] took the Kobayashi Maru approach, and simply redefined the rules of the game. But such is the power of the confounding negative voltage.